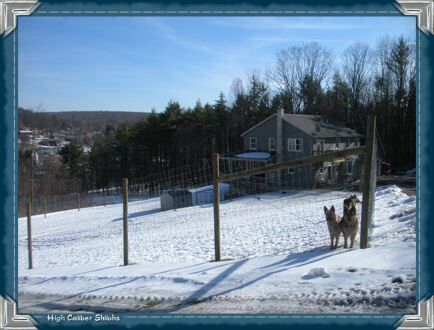 At High Caliber Shilohs, our breeding program is based upon in-depth research for the careful selection of breeding pairs, so that we may strive to produce healthy Shilohs with good temperaments, along with great beauty and intelligence, while continuing to work towards producing Shilohs which achieve the ideal breed standard. 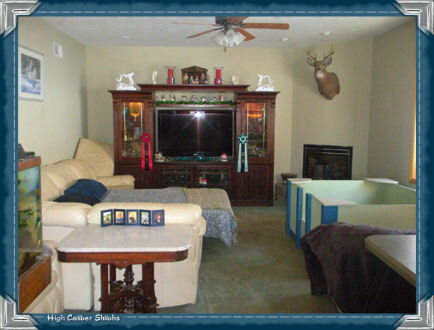 All litters at High Caliber are whelped and raised in our home. 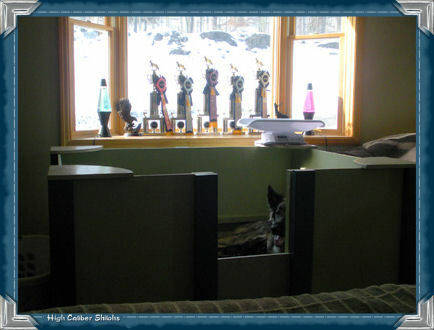 As the time of birth nears, the whelping box is placed in our living room, where the fireplace provides toasty warmth for newborns, the large bay window provides plenty of natural sunlight for growing puppies, and where I can pull out the sofabed to sleep next to the expectant mom and newborn pups, to be sure all is going well. 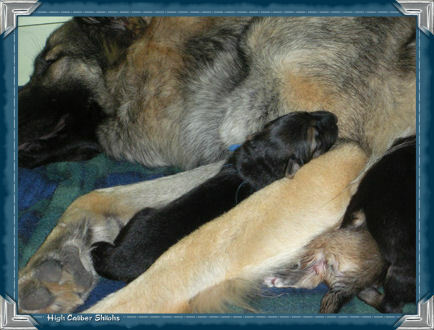 After giving mom and the new pups a couple days to settle in, each pup is handled on a daily basis, providing stimulation for the puppies and acclimating them to human touch and smell. As they grow older, the pups are introduced to many new objects and experiences and to new people of all ages. After their vaccinations, the pups also go for rides in the car, where they are taken to see new places and meet new dogs. Crate training is also begun here, along with bathing and grooming. 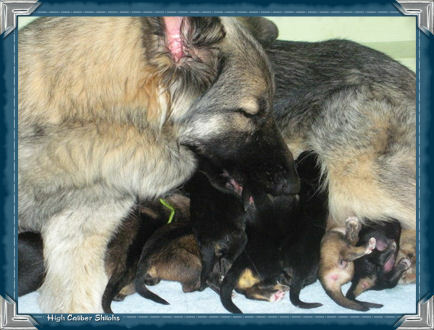 A litter evaluation is performed at about seven weeks of age, in order to determine each puppy’s temperament so that we can try to match it to the best home possible. Each puppy is sold with a health guarantee and a lifetime of support from us. We truly believe that Shilohs are the best dogs on earth. Actually, their great intelligence, sensitivity, understanding, and soulful nature, combined with their breathtaking beauty and compassion, somehow make them more than “just dogs”. They have so touched our lives that we have decided to breed in order to preserve the qualities now present in the Shilohs, and to further enhance the conformation, health and vitality of the breed. 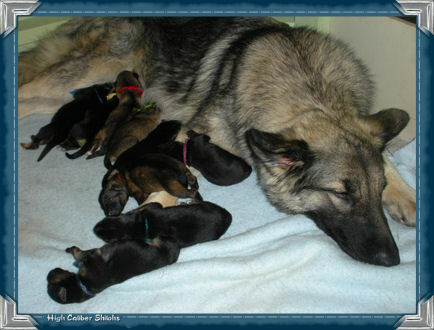 We pray that these precious gems are safe in our hands and that the work we do here will help the breed as a whole. We hope to teach more people about these amazing creatures, as we continue to educate ourselves and look forward to introducing others to the joy of owning a Shiloh.